A tsunami is a series of enormous waves created by an underwater disturbance such as an earthquake, landslide, volcanic eruption, or meteorite. A tsunami can move hundreds of miles per hour in the open ocean and smash into land with waves as high as 100 feet or more. From the area where the tsunami originates, waves travel outward in all directions. Once the wave approaches the shore, it builds in height. The topography of the coastline and the ocean floor will influence the size of the wave. There may be more than one wave and the succeeding one may be larger that the one before. That is why a small tsunami at one beach can be a giant wave a few miles away. All tsunamis are potentially dangerous, even though they may not damage every coastline they strike. A tsunami can strike anywhere along most of the U.S. coastline. The most destructive tsunamis have occurred along the coasts of California, Oregon, Washington, Alaska, and Hawaii. Earthquake-induced movement of the ocean floor most often generates tsunamis. If a major earthquake or landslide occurs close to shore, the first wave in a series could reach the beach in a few minutes, even before a warning is issued. Areas are at greater risk if they are less than 25 feet above sea level and within a mile of the shoreline. Drowning is the most common cause of death associated with a tsunami. Tsunami waves and the receding water are very destructive to structures in the run-up zone. Other hazard include flooding, contamination of drinking water, and fire from gas lines or ruptured tanks. 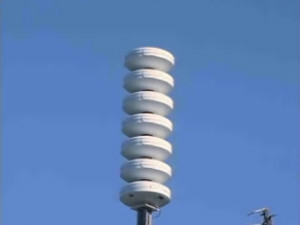 The sirens are at high-power capacity and have 2400 watts of power that cover up to a 4,000 ft radius. Optimum sound propagation conditions exist when there are no obstructions in the sound path, which means that wind speed and direction will be a prevailing factor in sound projection. The second tone is the REAL TIME evacuation blast, known as a wail tone. Evacuation for a distant tsunami will generally be indicated by a siren blast and an announcement over NOAA weather radio that the local area has been put into an official TSUNAMI WARNING. The wail tone varies from a low to high warble sound. In isolated areas along the beaches and bays you may not hear a warning siren. 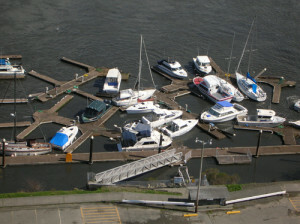 A sudden change of sea level should prompt you to move immediately to higher ground. Should the evacuation blast be activated, first evacuate away from the shoreline areas, then turn your radio to KCST 106.9 FM for more information. The third tone is the ALL CLEAR sound, which resembles the Westminster Chimes. You will hear this tone if the tsunami warning has been cancelled. The protocols state that the ‘all clear’ will run for one minute followed by a two minute rest period. This process will be repeated five times. At that time it is ok for people to return to their homes.